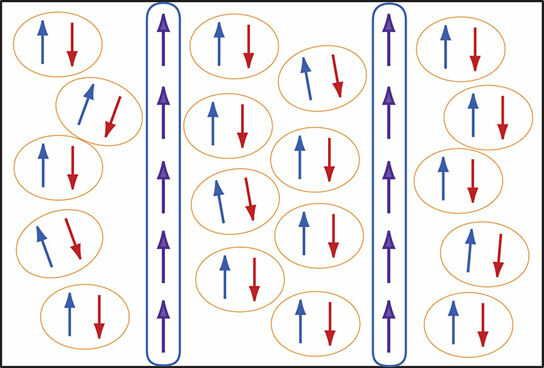 A diagram depicts unpaired spin up electrons congregating in discrete bands. A newly published study led by Brown University reveals new evidence for an exotic superconducting state that can arise when a superconductor is exposed to a strong magnetic field. Providence, Rhode Island (Brown University) — Superconductors and magnetic fields do not usually get along. But a research team led by a Brown University physicist has produced new evidence for an exotic superconducting state, first predicted a half-century ago, that can indeed arise when a superconductor is exposed to a strong magnetic field. Superconductivity — the ability to conduct electric current without resistance — depends on the formation of electron twosomes known as Cooper pairs (named for Leon Cooper, a Brown University physicist who shared the Nobel Prize for identifying the phenomenon). In a normal conductor, electrons rattle around in the structure of the material, which creates resistance. But Cooper pairs move in concert in a way that keeps them from rattling around, enabling them to travel without resistance. Magnetic fields are the enemy of Cooper pairs. In order to form a pair, electrons must be opposites in a property that physicists refer to as spin. Normally, a superconducting material has a roughly equal number of electrons with each spin, so nearly all electrons have a dance partner. But strong magnetic fields can flip “spin-down” electrons to “spin-up”, making the spin population in the material unequal. In 1964, physicists predicted that superconductivity could indeed persist in certain kinds of materials amid a magnetic field. The prediction was that the unpaired electrons would gather together in discrete bands or stripes across the superconducting material. Those bands would conduct normally, while the rest of the material would be superconducting. This modulated superconductive state came to be known as the FFLO phase, named for theorists Peter Fulde, Richard Ferrell, Anatoly Larkin, and Yuri Ovchinniko, who predicted its existence. To investigate the phenomenon, Mitrovic and her team used an organic superconductor with the catchy name κ-(BEDT-TTF)2Cu(NCS)2. The material consists of ultra-thin sheets stacked on top of each other and is exactly the kind of material predicted to exhibit the FFLO state. After applying an intense magnetic field to the material, Mitrovic and her collaborators from the French National High Magnetic Field Laboratory in Grenoble probed its properties using nuclear magnetic resonance (NMR). What they found were regions across the material where unpaired, spin-up electrons had congregated. These “polarized” electrons behave, “like little particles constrained in a box,” Mitrovic said, and they form what are known as Andreev bound states. Experimentalists have been trying for years to provide solid evidence that the FFLO state exists, but to little avail. Mitrovic and her colleagues took some counterintuitive measures to arrive at their findings. Specifically, they probed their material at a much higher temperature than might be expected for quantum experiments. This new understanding of what happens when electron spin populations become unequal could have implications beyond superconductivity, according to Mitrovic. It might help astrophysicists to understand pulsars — densely packed neutron stars believed to harbor both superconductivity and strong magnetic fields. It could also be relevant to the field of spintronics, devices that operate based on electron spin rather than charge, made of layered ferromagnetic-superconducting structures. This research was supported by the French ANR (grant:06-BLAN-0111), the Euro-MagNET II network (EU Contract No. 228043), and the visiting faculty program of Université Joseph Fourier, Grenoble. Be the first to comment on "Physicists Produce New Evidence for an Exotic Superconducting State"